Retro Review Month generally deals with games that are on platforms prior to this generation. However, I am always willing to make exceptions. Technically, Theatrhythm Final Fantasy is as retro as it gets. It takes thirteen Final Fantasy titles, grabs some classic songs from each game, and throws it in a blender to make one rhythm game. It couldn't be more retro if it tried! Here's my detailed judgment of Theatrhythm. Even though the quality of Final Fantasy has declined in my opinion over the years, the one constant that keeps me coming back are the sensational soundtracks that accompany each game. Even with the departure of the incomparable Nobuo Uematsu as series composer, the consistent quality of music for each game remains unrivaled. What better way to celebrate the music and the 25th anniversary of the Final Fantasy franchise than a rhythm game? This is uncharted waters for the series, but it seems like the perfect pairing. 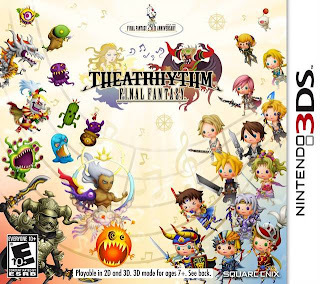 Has Theatrhythm Final Fantasy given us a competent rhythm game bearing the Final Fantasy name, or are those hopes just a fantasy? 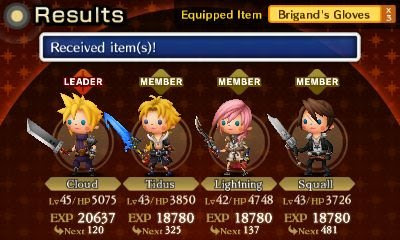 Theatrhythm Final Fantasy's main gameplay has players tapping, sliding, and holding their stylus down with terrific timing to the notes that horizontally scrawl on the upper screen. I'll refer to these notes as Triggers from now on. The aim of the game is to perform the appropriate action as the Triggers cross the mark on the right side of the screen. Some request that you simply tap or touch the bottom screen while others have you holding the stylus down or quickly sliding the stylus in the specified direction (left, right, up, down, diagonally, etc. ), though the latter can be infrequently read incorrectly by the game. Depending on your timing, you earn more points. If you are perfect with your timing on a given note, you receive a Critical rating. If you are somewhat fast or somewhat slow in your movement, then you receive a Great or even Good rating. Being off or doing the wrong action in the wrong direction gives you a Bad rating. Finally, letting a Trigger pass by without doing anything results in a Miss. Both Bad and Miss ratings end any kind of chain of completed Triggers you had going. Chains are important because they increase your point total as you successfully hit more Triggers in a sequence. Basic is essentially Theatrhythm for dummies. But the gameplay isn't as simple as all that. No, Square Enix and developer Indies Zero got some RPG into their rhythm game. You begin the game with a cast of thirteen Final Fantasy all-stars, each representing their own mainline game (i.e. FFIV has Cecil Harvey, FFVII has Cloud Strife, and FFX has Tidus). When you begin a game you amass a party of four members. 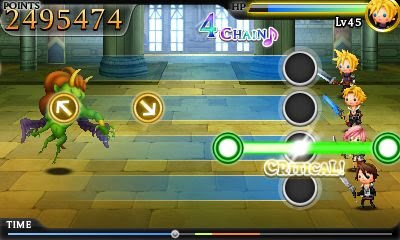 Party members earn experience points and gain levels just like in a typical Final Fantasy RPG. As they gain levels, they earn new skills and abilities to assist them in the actual rhythm performances of Theatrhythm as well as increased stats such as upped Attack and Agility. Within each rhythmic performance, if you as the player fail to perform the appropriate action (tapping, sliding, holding, and whatnot) receiving a Bad or Miss rating on a given Trigger, your party takes damage and the life gauge on the top right corner of the screen lowers. If the bar gets to zero before you complete a song, you get a Game Over. Thankfully, the aforementioned skills and abilities can help you out such as giving your party increased attack capabilities when their HP lowers to a certain rate. There are three main modes to playing Theatrhythm: Series, Challenge, and Chaos Shrine. 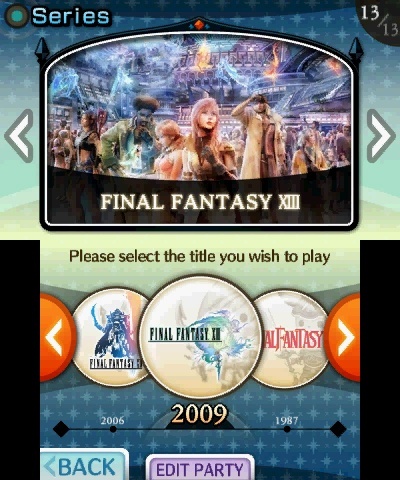 Series is a mode where you play through music from each of the thirteen mainline Final Fantasy games. The downside of this mode is that only the Basic difficulty is available at first, and it's really easy for rhythm game pros. Nonetheless, you need not play the Final Fantasy entries in order. Each title has five songs that you play through in a successive fashion. The start and ending of each game, Demo Music Stages (DMS), play the same - a crystal rests in the center of the touch screen, and as music notes reach its center, you tap the screen. Unlike the other types of rhythm romps in Theatrhythm, these types of stages cannot be failed, and they also can be skipped at any time. releases of each Final Fantasy entry. The ham and cheese, if you will, of a Series mode sandwich are the Battle Music Stages (BMS), Field Music Stages (FMS), and Event Music Stages (EMS). The Demo Music Stages always bookend these three types of stages, though the BMS, FMS, and EMS don't always show up in the same order; it differs depending on the Final Fantasy game you select. Let's start off with the most challenging of stage types, the Battle Music variety. Here, there are four tracks, each designated to one of your four party members. As Triggers move from left to right across the top screen, you must perform the necessary touch screen input as they pass over each character's mark. When I originally saw this setup in a trailer, I was worried on whether or not the player would have to touch a specific part of the touch screen depending on which tracks the Triggers were on. Thankfully, this doesn't matter. You can touch anywhere on the bottom screen to satisfy the game. As you fortuitously tap, slide, and hold on Triggers, you give damage to the enemy on the other side of the screen. The goal here is to defeat as many enemies as you can. The more enemies you defeat, the more experience you earn and the better chance you have of coming across an item or other collectible. If you are perfect when a series of silver Triggers arrive (which results in what the game calls a Feature Drive), you can unleash an astonishingly powerful summon like Ifrit, Shiva, or Odin to take out your foe. Having characters that have high Attack and/or Magic is paramount if you wish to take out an abundance of enemies in one stage. Having high HP and a high level also gives you more wiggle room if you miss a myriad of Triggers that would otherwise make you get a Game Over. Show that Behemoth who's boss. Then there's the Field Music Stages that, unlike the BMS, require you to focus on one string of Triggers as opposed to four. The leader of your party (who incidentally always earns the most experience at that spot) saunters along a field, moving right to left. Along the way he or she passes by various landmarks from Final Fantasy games. For instance, in Terra's Theme from Final Fantasy VI, your character will see Figaro Castle glistening in the desert sun while in Final Fantasy IX's field stage, the famous Iifa Tree looms in the background. Just as you can in the BMS, you can touch the bottom screen anywhere when each Trigger overlaps the mark. However, this changes when you have to hold the screen. Then you must move the stylus to follow the green holding line to hit each midpoint. If you obtain the Feature Drive in Field Music Stages, you get to transform into a blazing fast Chocobo, moving with much greater speed than your normal character can. Depending on how much ground you cover in an FMS, you get a better chance to earn items. A character with high Speed is recommended for these types of stages. As the band Toto once sang, "Hold the Line." Lastly, there's Event Music Stages. These put up various game footage of the series title you are currently playing. 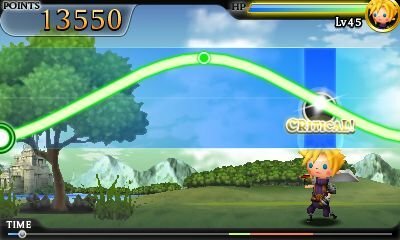 Unfortunately, Theatrhythm uses the original Japanese versions of the Final Fantasy games, so in the 8 and 16-bit era titles you get Japanese symbols instead of English. This also spreads to the soundtrack where songs that were originally Japanese stay Japanese. This is fine if you care about authenticity, but what about the rest of us who have nostalgia for the English iterations of these games and adore the cheesy lyrics of Melodies of Life? It just yells "lazy localization" to me in some regards. Regardless, back to the EMS. Here, the Triggers pop up all along a line that moves all around the top screen. It isn't a linear line like in the previous two stage examples. What can be a killer is when a song like the heartfelt Celes's Theme changes tempo, as well as in post Final Fantasy VI Event Music Stages when the background of the top screen is full motion video. It makes trying to follow the Triggers particularly distracting. 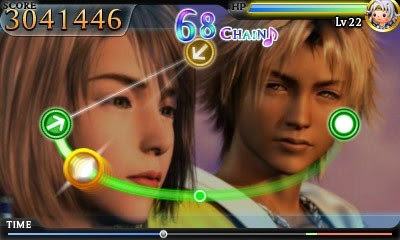 Earning a Feature Drive in this type of stage allows you to view and play an extended ending of a given song and video. moments in these event stages. But therein lies the problem with Feature Drives and the whole RPG element of the game. In order to receive a Feature Drive, you must have items and/or abilities equipped to a given character. However, in order to score higher than 7,999,999 points and receive an SS ranking or above, you must have nothing equipped to your characters at all. This is especially egregious in Challenge Mode, the mode where you can play any unlocked song freely, where you want to go for the largest possible score. This essentially removes the RPG element of the game entirely. As you complete songs you earn Rhythmia, the stuff with which you unlock in-game content such as Encore songs and Music Player and Movie Player content. New stuff constantly unlocks at increments of 500, so in essence you always have something to bait you into playing more. 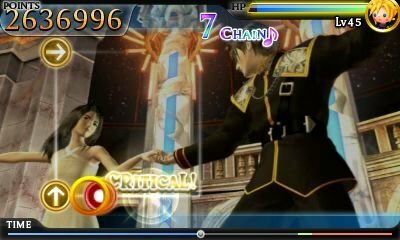 You can receive Rhythmia bonuses at the end of songs for having a high chain of Triggers in a given song, beating a song for the first time, having an all male or all female party, using the lead character of the series you are currently playing (e.g. using Squall for a Final Fantasy VIII song), and other notable accomplishments. That said, as my tagline of this review suggests, Theatrhythm Final Fantasy can be an extremely long grind. Building up characters to worthwhile levels, earning new songs and unlockables through gaining more Rhythmia, fighting the same bosses over and over again in hopes that they drop the items you want, etc. It gets exhausting after a while and sort of overwhelming if you try to do it all at once instead of piecemeal. the grind is definitely on in Theatrhythm. Regardless, that does mean you get a lot of bang for your buck as there is a lot of content to be found. Each of the 70+ songs of the game have three difficulties. Basic has slow moving Triggers while Expert ups the ante with faster, more numerous and consecutive Trigger types (oh, the humanity at those directional slides all in a row! ), and Ultimate? Forget about it - at least for me. Then there's the bevy of upcoming and current downloadable songs which cost a dollar apiece. Not only do they give you new music to enjoy, but they have their own backgrounds to adore. Want to experience a Cosmo Canyon-inspired Field Stage? Have at it! 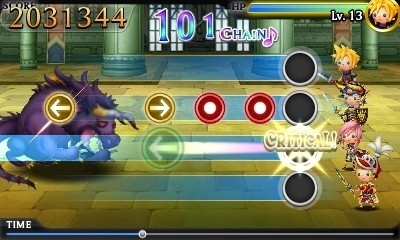 The final part of the trio of music mode options for Theatrhythm is the Chaos Shrine. By earning Dark Notes, you can participate in these two movement games: one field and one battle. The higher the Dark Note number, the more difficult the Dark Note. And did I mention that the Triggers are absolutely positively randomized each time you play a specific Dark Note? There is a good reason to play Dark Notes, though. If you succeed in getting far in the field stage, you face a boss during the battle stage which can drop sensationally valuable crystal shards. These come in multiple colors, and collecting all eight of a given color unlocks a new character to play as. From FFVII's Aeris to FFVI's Locke, there's plenty of crystal shards you'll want to grind (there's that word again) for to unlock your favorite Final Fantasy all-stars. Outside of the main musical modes, there is a bevy of options. You can listen to unlocked songs and watch unlocked movies in their respective players. You can collect and read up on CollectaCards, earned through playing battle, field, and event stages as well as through special passwords. There's even something for stat hounds that records and stores how long you've played, what characters you've used the most, what songs you've played the most, how many critical hits you've gotten, how many perfect chains you've nailed, and the encyclopedic list goes on. In addition to all that, there is StreetPass functionality where you can trade profile cards and Dark Notes with a passerby and Multi Play with a local friend who owns their own 3DS and game card. 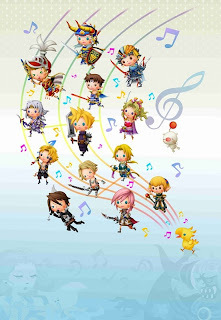 You have a profusion of activities to occupy yourself with in Theatrhythm, possibly more than in any other rhythm game to date. Theatrhythm has an exceptionally cute chibi art style that perfectly creates a uniform look for all Final Fantasy characters and monsters. Even ol' Safer Sephiroth doesn't look all that intimidating when he's in chibi form! The game is just a vibrant delight, and the 3D effect actually helps push the various Triggers out to the forefront to make them simpler to see. As for the music, you may or may not like the selection of songs provided. It's all subjective anyway, but a lot of great ones are there like Aerith's Theme (FFVII), One-Winged Angel (FFVII), Dancing Mad (FFVI), Blinded By Light (FFXIII), Saber's Edge (FFXIII), Theme of Love (FFIV), Behind the Door (FFIX), Waltz of the Moon (FFVIII), Blue Fields (FFVIII), and as I said, more downloadable songs to come. Even the arranged tracks that occur during menus are exceptional. And by the way, yes, you CAN turn off or lower the volume of the chimes that occur when you respond to each gameplay Trigger to make your musical and rhythmic experience less of a bother if you so choose. Can you obtain the elusive Perfect Critical Chain? Ultimately, Theatrhythm Final Fantasy is an amazing rhythm game that is a tremendous love letter to Final Fantasy fans the world over. You don't need to be a fanatic to like what is here. You just need to like extremely capable rhythmic gameplay. The actual music is just a bonus. The variety of wonderful arrangements throughout the series' history has been a Final Fantasy hallmark, and my favorite aspect of the series. The incessant amount of grinding necessary to get everything in the game is annoying and sometimes smothering, but taking the game at your own pace will ease the burden for the most part. If you are in the market for a rhythm game that is filled to the brim with content in the present and in the future with DLC in the form of new songs, Theatrhythm Final Fantasy gives a brilliant performance.